It came as no surprise that every response to Inglourious Basterds came as no surprise. When word goes out that a film will be about the Holocaust but not really, because it’s actually about old movies; when it’s expected to be a slam-bang adrenaline-powered summer thrill ride but not really, because a major American filmmaker has conceived it, then positions about the picture become so many pre-dug holes, waiting for occupants to tumble in. Merely by calling the film Inglourious Basterds–as if its contribution to the vast body of World War II cinema might amount to a couple of misspellings plopped into a title copied from an earlier, cheaper film–Quentin Tarantino promised indelicate pleasures to those who wanted them and pre-emptively shrugged off criticism from those who might want more. It was, in a way, a self-protective move–perhaps even a timid one, coming from a filmmaker who makes his living by a show of boldness; and many more were evident in the trailer, the print ads and the prerelease puff pieces, all calculated to ensure that nothing could be said about Inglourious Basterds that Inglourious Basterds had not first said about itself. So I choose to have no opinion about this film. Indifference is the only unforced response left to me. This isn’t to say I’m indifferent to evidence of widespread credulity among those viewers of Inglourious Basterds, fans and detractors alike, who accepted the improbable claim that a film can refer to nothing but other films. Nor am I indifferent to a situation in which the entire reception of a film can be produced along with the movie. We have gone beyond cinema’s long-familiar modes of culture and commerce: DeMille marketing his epics as a redemption for their own sins, Minnelli both exposing and reveling in the dream factory’s artifice, Hitchcock instructing audiences in how to think about a Hitchcock movie, Herschell Gordon Lewis outraging every decent feeling (and so, predictably, attracting a cluck of admirers). With Inglourious Basterds, we reach one of those moments that tell us we’re in new territory, where unforeseen, uncontrolled reactions are being foreclosed as never before. This complaint, as I said, is not about the film as such; nor is it meant exclusively about Tarantino. Despite the colossal assertions commonly made about him, he’s only one of a great many people who have brought us to this spot. I’m concerned with the aggregate. With some of them coming in from the industry side and others from the side of vulgar Kaelism, they have executed a kind of pincer movement over the past decades, and in so doing have swept us all toward those holes in the ground. Start with the industry. For the past quarter-century, it has largely devoted itself to expanding the field of in-home entertainment while reducing the role of theatrical exhibition–a development that has required companies to scramble for appropriately scaled economies of production and distribution. The solution has been the institution of a multi-tiered system: big-budget films released onto thousands of screens at once, under the names of major studios; more modestly budgeted pictures given platform release by the studios’ specialty divisions and by a surviving handful of midsize distributors; microreleases sent out by small companies for a round of one- or two-week runs at a few theaters dotting the country; and an unquantifiable mass of dumped-onto-digital material. One consequence of this recently evolved system has been the cretinization of most pictures released by major studios during the first ten months of the year, followed by the release of ostentatiously brow-furrowing pictures for the final two (which are dedicated to awards-qualifying runs). Another consequence has been the invention of a prestigious “independent film” made up of those midbudget pictures that have been chosen for platform release and a publicity push. Because these Mercury Sables of American cinema don’t need to make $60 million over the opening weekend, as the Ford Expeditions do, they can afford on average to be less crude and lumbering, and so to some degree represent an alternative. The fact that these movies have been picked out for promotion, rather than being left to clamor for a slot at Anthology Film Archives, suggests that the marketers of “independent film” sense a limit to the public’s appetite for alternatives. Of course, to listen to the industry’s shills–entertainment reporters, dutifully crying out the box-office figures–you’d think those carefully respected limits did not exist. In standard accounts, the so-called independents have mounted a critical challenge to the major studios, which are said to resent the lack of respect accorded really lucrative pictures. Yet look at how in mid-November these same shills can announce which pictures will contend for Academy Awards, almost before the screenings have started. The industry is strangely quick to reach consensus. And notice how the same movie titles then show up week after week through February, some representing Fox and some Fox Searchlight. Despite the expansion of choice supposedly fostered by the independents, for four months of the year no more than ten movies are talked about. If Inglourious Basterds should turn out to be one of them, nobody will even know to which tier of the system it belongs. Tarantino and his producers, the Weinstein brothers, are closely identified with the official version of independent film, and the reported budget of $70 million is not huge for an action picture starring Brad Pitt. But then, Universal Pictures shares production credit with the Weinstein Company, and the film opened on more than 4,000 screens, making it a tossup whether Inglourious Basterds is also a big-studio release. Judge from this how little friction the top tiers can cause each other and how smoothly Tarantino fits into their economy. He knows how to work at just the scale the industry needs–and his aesthetic is just right for the notion of film art that has coalesced in America since the 1970s. I have called this notion vulgar Kaelism, knowing that Pauline Kael would have derided one of its principal tenets: that the movie theater ought to be a refuge from artistic norms and imperatives, where we’re all free to revel in trash. “Yes, but,” Kael would have said–in fact, did say–and the “but” was the bigger part of her argument. To the vulgar Kaelist, though, movie trash now comes with an imprimatur. Pump into this mindset a few more ideas that have become denatured by constant recirculation–a concept of Hollywood history that grossly overvalues genre filmmaking; a version of auteurism that’s little more than hero worship; a definition of “cinematic” that’s always about speed and movement, never framing and duration–and you’ve got the cloudy condensate that now sloshes through the heads of fan boys and pop film critics alike. It might seem at first glance that these people are engaged in the long-established practice of discovering meanings and artistic merits in products that look like mere entertainments–but that’s no longer the game. They’re fetishizing the authorial look of entertainments that are careful not to be too meaningful. It’s obvious why this attitude toward film would be wonderfully encouraging to a system in which second-tier products must be different but not that different. And the tier system, in turn, has warmly nurtured the vulgar Kaelist attitude, whether it’s found in fans, filmmakers or (in Tarantino’s case) both. Let me say again: Tarantino is one participant among a great many in developments that have proceeded haphazardly, often catching up other filmmakers in similar ways, if not always with similar success. (Look at the career of Tom Tykwer, from Run Lola Run to this year’s dismal The International.) But if the route that has taken us here is meandering and muddy, its outcome is plain enough. The number of films in mainstream discussion has shrunk (even while the sum total of films and film chatterers has swollen); and of these few, a significant number will be considered artistically valid precisely because they don’t give you much to discuss, other than the skill of a genius director at delivering recognizably movielike sensations. I would prefer not to be locked inside this closed system, where a thought can’t find room enough to move. I bet that’s how you feel, too. So let me step outside the bounds by telling you about two films of minor market consequence. Unabashedly artistic, not just in look but sensibility, they nevertheless are more daring than any midbudget auteurist splatterfest I can name. 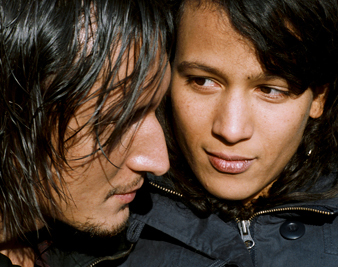 Claire Denis’s just-released 35 Shots of Rum takes place on the tracks of Paris’s regional train lines, in the rooms of suburban apartment blocks, along streets populated mostly by black and brown French people, between the glances of family members and lovers. Which of the characters are family and which are lovers is not immediately obvious. For a while you just know that these people watch one another, and watch for one another, with patience and concern, overlaying the network of the big city’s movement with an intimate and still geometry of their own. Lionel (Alex Descas) stands beside the tracks from afternoon until nightfall, smoking and watching the trains go by: a middle-aged man with the physique of a heavyweight fighter but not the vanity, solid, pensive, reliable. Joséphine (Mati Diop) rides a train, goes shopping, comes back to her apartment. She’s a slim young woman with the long, serenely sad face of an African sculpture; and when Lionel comes home, she hurries to look after him, bringing him his slippers, serving his supper, noticing his every gesture and mood. Round and smooth-haired Gabrielle (Nicole Dogué) has a way of seeming bundled up in herself as she smiles at nothing and waits, and waits, sitting on the stairs in the apartment building or gazing out her window at the tracks. As for Noé (Grégoire Colin), the only pink-skinned character in the film, he shows up in the shadows of the building looking like a threat, with his long, greasy locks and muscle-boy clothes. A close-up, shot from below, lends him an air of menace; but his eyes turn toward Joséphine’s door with a look of purest longing. He is the neighbor who comes and goes, loving Joséphine but never letting her hear it. Gabrielle is the woman who is not Joséphine’s mother, though she wishes she were. And Lionel is Joséphine’s father–though the way she treats him, you could imagine he’s her husband instead. 35 Shots of Rum is the story of how you gradually figure out how these characters fit together. It’s the quiet, profound, beautifully observed story of how they figure themselves out, and get unstuck, and at last find a new configuration for themselves–a little movement. Denis risks everything on domestic emotions in 35 Shots of Rum. Jane Campion, by contrast, dares to make emotion strange in the just-released Bright Star, her fact-based period drama about the love between a smart young dressmaker, Fanny Brawne, and the frail, impecunious poet who moves in next door, John Keats. He’s played by Ben Whishaw, whose face, when shown from its most characteristic angle, becomes a sliver of moon–waning, most likely, considering the film is concerned with Keats’s last years. She is played by Abbie Cornish, who at her most characteristic angle is the moon in full. An artist in her own right, proud to have created the first triple-pleated mushroom collar in Hampstead, Fanny at first shines sociably on Keats, remarking that the quality she most enjoys in writers is wit. “Wit,” he grimaces. “Things that make you start, without making you feel.” Her initiation by Keats into poetry–his type of poetry–will teach her to feel deeply, until she’s dressed in black and howling in a barren woods. If the theme of Bright Star is the realization of oneself in natural emotion, the method is gorgeously unnatural. Campion knows that the early nineteenth century is alien to us and so makes the most of costumes that look like they’ve devoured the hapless wearers and customs that resemble the rites of far-off tribes. And then, having respected the difference between Fanny Brawne’s world and ours, Campion collapses it by bringing out the physical texture of everything, from the touch of fabric against the skin to the peculiar timbre of a voice raised in song. Every sensation seems more immediate than it would be for us today–the quality of the air when the seasons change, the glow of the Vermeer light when it pours through a window. So the characters’ education into love becomes immediate for us, too. Here are two profoundly moving pictures that do leave room for you to think, and discover, and feel for yourself. Their authors, being middle-aged women, have scant chance of being touted as cool. Their artistry, having little commercial oomph, has no chance of being cited by op-ed writers looking to give a little zing to the zeitgeist. All these films do is risk engaging your emotions instead of your memories of other films. They strive to deepen your experience of life, not substitute for it. Entertainment reporters would call them niche films. I’d say that niche is as big as all outdoors.